Pulled Pork, Chili, Cheese, Olives, Jalapenos, Green Onions, Sour Cream, Guacamole, Salsa. If you say you have no regrets in your life, you’re a goddamn liar. With the YOLO lifestyle espoused by today’s young folks, everyone is making terrible decisions that they’ll undoubtedly think twice about later, some more so than others. Me, oh I’ve got regrets, some nacho related (like not starting Nachonomics on geocities or angelfire back in the day before the internet was a thing) but sometimes the universe doesn’t sneeze into your open mouth. Sometimes when life gives you lemons it goes “Oops, my bad!” and takes them back and instead gives you a sack of cash. Sometimes instead of a sack of cash it gives you a second chance at getting nachos at a place you really wanted to get them at previously but couldn’t. Sometimes places with Bigfoot for a mascot that you missed out on the last time you traveled through the airport where it’s located for hypothetical example. Two months after the last time I was at the Seattle Tacoma airport I returned. only this time with a two hour layover and a hunger in my soul. I made my way out to the North Satellite, walking past the spot where not long ago I had stood staring wistfully at Bigfoot Food and Spirits, but not this time. I entered the restaurant, sat down with confidence and ordered the Big Foot’s Nachos UR Way, again bemoaning the text speak use of UR that Bigfoot would not approve of. I do think he’d care for the though. 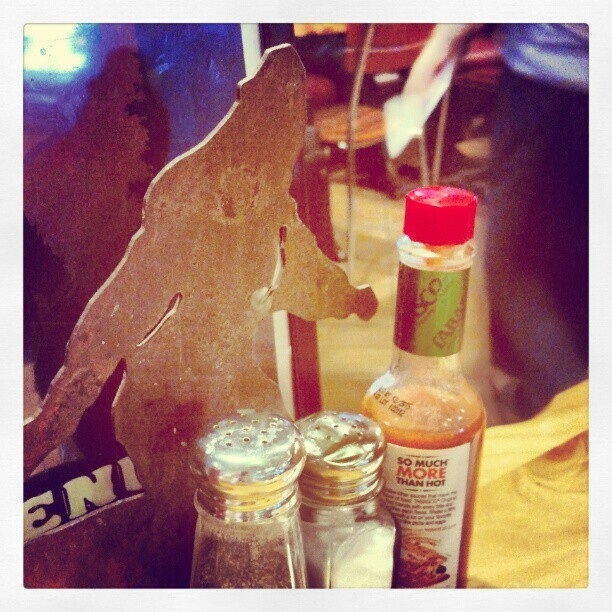 As awesome as a Bigfoot napkin holder would be to steal, they’re bolted to the tables. Frequently I have had good nachos, occasionally great nachos, and very rarely nachos that I would call epic. Only three times have I had nachos I would describe as legendary; The Mount Nacheesmo at Tio’s, The Buffalo Nachos at John Harvard’s Brewhouse, and coming in third, The Big Foot’s Nachos UR Way here. Here’s the caveat, I’m a huge pulled pork fan and it’s possible that it has influenced my opinion of these. I like to think that I’m impartial, and that being said I can impartially tell you that these are delicious. They’re definitely more a member of the chili nacho family than your standard nachos, but this is certainly the best example of the chili variety I’ve had. The chips, fantastic, the pulled pork, scrumptious, and the guacamole, sublime. In what amounts to a perfect ratio of toppings to chips, the what at first seems like a heaping pile of pulled pork works out nicely on the per-chip allotment. Plus the pulled pork is AMAZING. If you like pulled pork and you love nachos, you’ll love these. So if you’ve got two hours to kill, and don’t have an irrational fear of Bigfoot, hit this place up. Even if you do however, figure out where your plane is leaving from before deciding to spend the time chowing down on these bad boys, because if you have to run the mile across the entire airport to get to your gate you’re not going to make it and they’re going to start calling out your name and saying the plane is going to leave without you and it’s just no good. Hypothetically of course. Seriously though, as good as these are, don’t miss your plane for them. I also recommend that you get a shirt professing your repeated sexual assaults by a Sasquatch.